Eyes: Rich ruby, deep garnet core. Nose: Cherries, currants, black tea, mocha, cedar. Nuanced floral component that lifts the wine. Mouth: Medium body, with a plush mouthfeel. Ripe cherry, blackberry pie, rosemary, red licorice, and dark chocolate provide a juicy mid-palate, supported by elegant tannins, and oak on the finish. 2013 was a generous vintage for Napa Valley vineyards. Optimum growing conditions allowed the vines to produce plump, yet concentrated clusters, with bright fruit profiles and vibrant acidity. Yields were above average, even after a bumper 2012 and another drought year in California. The result was all that a winemaker could ask for. The Cabernet Franc selected for our wine in 2013 was grown on an east facing slope, gravelly loam soil, from the backside of Alta Heights in the Coombsville AVA of Napa Valley. We really think this was a perfect combination of site, varietal and vintage year to produce a special wine. Cab Franc is a vigorous vine, and without thoughtful vineyard management you can have over-cropping. Not the case here: minimal groundwater, canopy and cluster maintenance, allowed these fruit sets to fully ripen, and be harvested with sugar and acidity in perfect balance. If you pick too early, with green stems and green seeds, those vegetal characteristics will persist into the wine. If you wait too long, you may round out some of the green notes, but risk the acid respiring, and losing varietal character. Rarely bottled as a single varietal in Napa, it is often blended into Cabernet Sauvignon to add complexity to aromatics, and silkiness to mouth feel. We didn't try to do too much with this Cab Franc: native primary and secondary fermentations with slight touches of new French oak really showcase this varietal. Cherry and cedar aromatics, blackberry pie, crimson mid-pallet, vanilla, currants and rosemary on the finish. This ﻿is not your Bistro Breton, it’s an elegant, well-structured, versatile wine ﻿that you should be proud to share. Brian spent many lectures in college sketching cellular diagrams, always fascinated by the natural order of Biology. Upon moving back to Napa and studying viticulture with Dr. Krebs at NVC, it became clear, the true star of the wine industry was the grapevine itself. An organic, repeatable process, made up of trillions of individual cellar compounds…a beautiful factory. 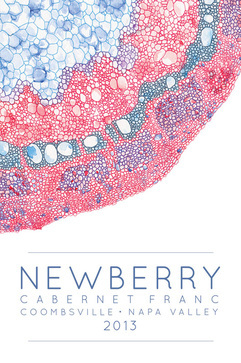 The illustration on our NEWBERRY label is by Napa artist/designer/flower-trucker Andrea Jalaty; an ink/watercolor interpretation of a grape stem cross-section viewed through a light micrograph.